Below is a photo of Willie John McQuiston drumming on a Lambeg drum with the likeness of his own father on it. 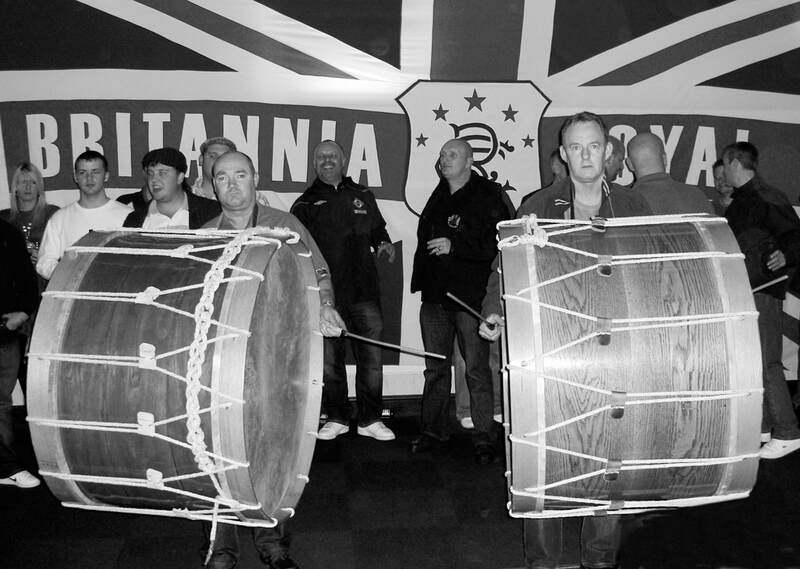 This drum is famous in Northern Ireland and travels to many events. This branch of my family has had at least five generations of drummers. What type of music would best exemplify true "folk" music? More importantly to the readers of this column - What type of music would best exemplify an exclusively Scotch-Irish or at least Ulster-Scots folk music? That music is performed in Fife and Lambeg drum units associated, for the most part, with the Unionist or Orange Order of Ulster, but historically, also used by Catholic organizations. There is nowhere else on earth, besides Northern Ireland, where true Fife and Lambeg performances are regularly held. The Lambeg drum descends from other earlier marching drums. It takes its name from the village of Lambeg, in County Antrim, Northern Ireland, and has at least three different traditions pertaining to its origin. First, when William of Orange came over to Ireland in support of Scots living in Ulster, during the 1689-90 uprisings, he brought fife and drum bands with him. It has been said that, as he began his military march from Belfast, he was met at nearby Lambeg by many supporters. A secondary idea, based on the first, is that the Lambeg drum was first developed in Lambeg, however this is not widely accepted. The most commonly accepted theory is that Lambeg, Northern Ireland, is where the drum was first sounded with canes rather than drumsticks. The size of the Lambeg drum has grown from the smaller European drums into one of the largest drums regularly carried by a human and also the loudest drum - so loud it can reach about 120 decibels and can reportedly be heard up to 5 miles away. The reason for the growth may have been one drummer simply trying to outdo another. Lambeg drums are typically made of oak, for long life, and resistance to insects.The drums have gotten so loud that the fifes can barely be heard over them. Fifes are basically hollowed out pieces of wood with 6 holes for changing notes. In some cases, during competition, fifes have had to use microphones to be heard above the drums. The fifes used in Ulster are unique. While most countries have fifes tuned to "Bb", Ulster uses a tuning close to the key of "D", only slightly lower, near "C#". This seems to be the key that can cut through the drumming the best. It is nearly impossible to play the Ulster fife with other types of instruments because of this tuning. ​Most of the songs played by these bands are old Scottish, Irish and English reels, jigs and hornpipes set to marching beats. These beats have themselves developed into many different syncopated rhythms. There are two types of drumming - "timed" drumming for mass bands and marching, and "competitive" drumming, where individual prowess is displayed. Each drum is personalized to the degree that care of it, recipes used to keep drum heads in good shape, techniques of tightening the head - all may vary from player to player. Many drums have extravagant paintings decorating them. There are songs known and played by most of the Lambeg bands but there are other songs specific to villages or individual groups, which are not always known by others. Over the last 20 years or so an effort has been made to collect these songs and bring these varied groups together into a more uniformed folk genre. Lambeg groups are very independent. They don't typically wear uniforms and are rather indifferent in their dress, marching order, and parade decorum. It is generally all about the performance. That Lambeg drumming is a true folk music is proven by members of many generations participating in this practice. For instance, in my own family, five generations ago, Samuel McQuiston was so famous as a Lambeg player that a drum with his image on it was created and is considered a collector's item. The photo accompanying this column shows Samuel's grandson, William John McQuiston, at the age of 83, playing that famous drum. William's father played, as did his son, Alan McQuiston, who unfortunately was cut down by an IRA bullet while trying to disperse a gathering crowd. In the photo below, Willie John's grandsons, Billy and Eddie McQuiston, are shown at a Lambeg celebration from 2009. At least five generations of this ancient Ulster family, who arrived in Ireland in 1565, have been Lambeg drummers helping to prove that this is a unique and truly a "folk" style of music mostly associated with families from Ulster.